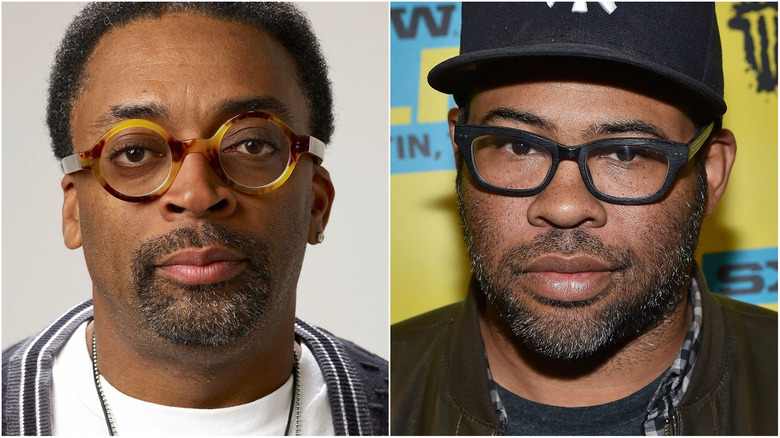 Spike Lee and Jordan Peele are creating a dream team for a new movie together. Variety reports that Lee will direct and produce with Peele on Black Klansman, based on the true story of an African-American police officer who infiltrated the Ku Klux Klan. Denzel Washington's son John David Washington (Ballers) is in negotiations to star in the movie for Focus. Jason Blum of Blumhouse Productions, the studio behind Peele's breakout hit Get Out, will also produce. The movie will follow Ron Stallworth, a Colorado detective who, in 1978, answered an ad in the local newspaper seeking new Klan members. He gained membership and climbed the ranks to become head of the local chapter. Stallworth, who is black, was able to learn plenty of information while pretending to be a white supremacist on the phone or through other correspondence. He sent a white officer in his place for in-person meetings. During his work undercover, Stallworth was able to sabotage several cross-burnings and other activities that the hate group had planned. No further details are available about the movie, but we'll let you know when we hear more. Meanwhile, Peele has said he has ideas for at least four more social thrillers like Get Out. Learn the untold truth of that unexpected hit.